It's not that I iron clothes, but that I need to be able to press seams when I sew. And I have a bad back, so there's no way I'm going to go and get an ironing board every time I sew a seam. My sewing machine is in the balcony along with some cabinet pieces that belong to my landlord. Two of them piled up make a great ironing-board height, so I decided to give one of them a temporary ironing-board top. 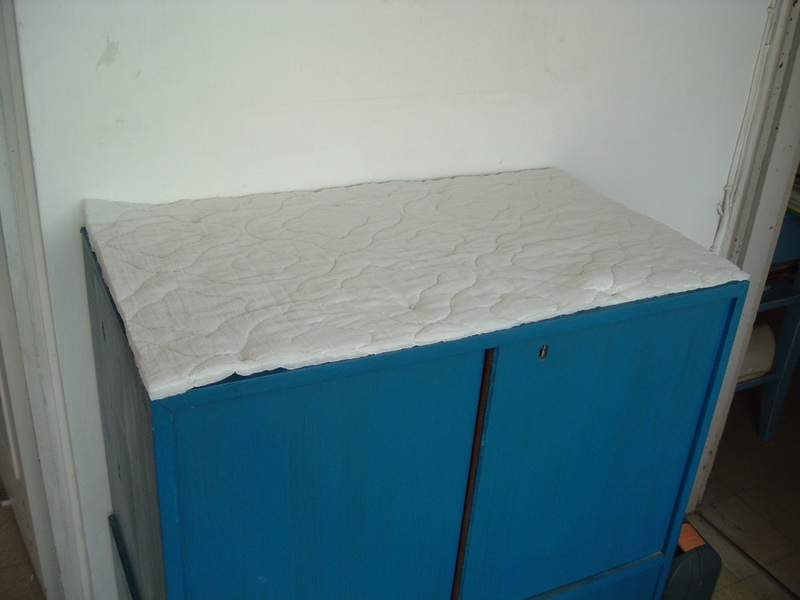 I took on old mattress protector for batting, an old thick cotton sheet for covering and with the help of Velcro strips I put my temporary ironing-board top together - and I love the result (I keep petting it when I pass it. Ibetter stop that)! And it's totally removable (and washable. and does not jeopardize my deposit). Step 1: 1. Measure the Cabinet Top. 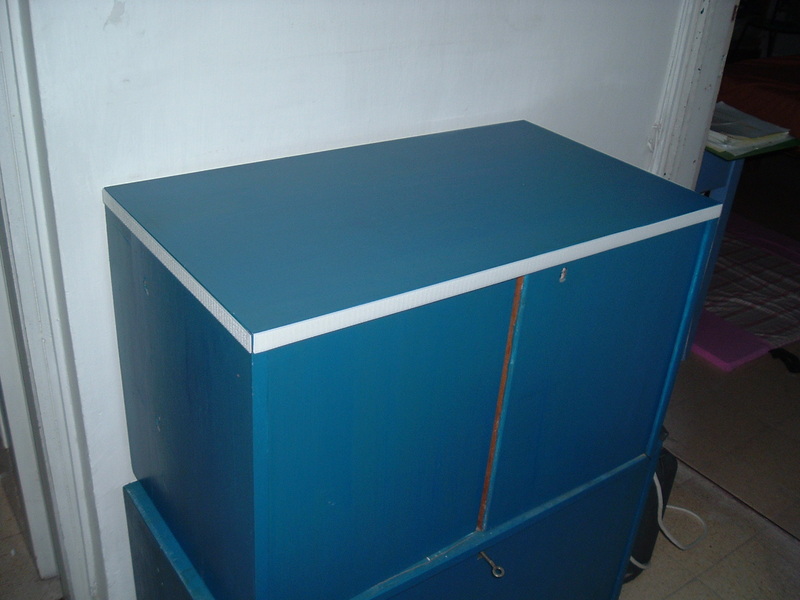 Batting*: one piece of batting the same size (width and depth) as the cabinet top. The batting should be made from material that can take heat (and not melt). I used cotton (doesn't melt. takes heat fairly well). *I cut up an old never to be used again mattress protector (it didn't seem thick enough, so I doubled it to two pieces, one on top of the other). Velcro Loop Strip for Sewing (Loop is the hairy side): enough to encircle the cabinet top - twice the width and depth of the cabinet top (for sewing means it has no tape on the back). Try for the narrowest strip you can get, so it won't get in the way of the cabinet doors. Cut into two strips the size of the cabinet top width and two strips the size of the cabinet top depth. 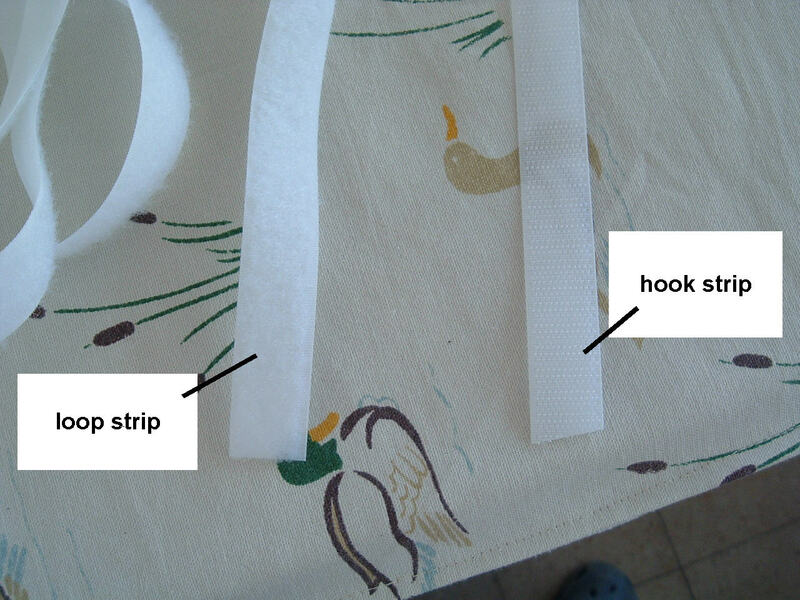 Stickable Velcro Hook Strip* (Hook is the side that cloth sticks to): enough to encircle the cabinet top - twice the width and depth of the cabinet top. Same width as other Velcro strip. *I used a sewing strip and stuck double sided tape on the back. 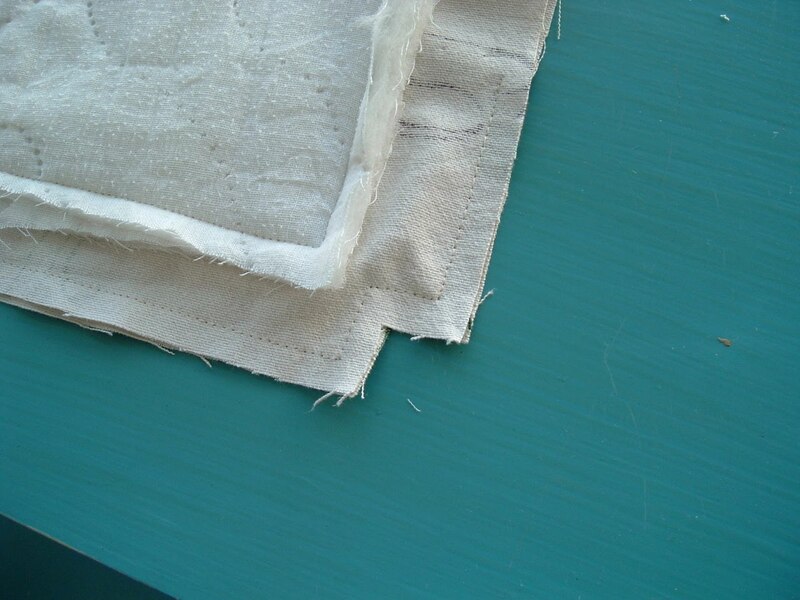 Cover Material: 2 pieces of light colored thick cotton or linen (material that takes heat well and won't transfer colors)*, the size of the cabinet top + twice the width of the Velcro strip + two seam allowances + 1 cm/half inch (to add a little give for the volume of the batting). Number example: My cabinet top was 70cm wide with a depth of 40cm, the Velcro strip width was 2cm and I leave seam allowances of 1cm. I used 2 pieces of 77cm (70+1+2+2+1+1) on 47cm (40+1+2+2+1+1). Cut off squares the width of the Velcro strip from the Cover material pieces (see picture). The width of the Velcro I used was 2 cm, so I cut off squares of 2 cm from all the corners. Take one piece of Cover material (the one you like the least) and center the Batting on the wrong side of it (should be around 1.5cm inside of the cut corners). Sew the Batting to the Cover material. Place the Cover pieces together (one of them now has the Batting attached) with the right sides facing each other, and the wrong sides out. Pin together. Sew together all the way around leaving something like a 20cm (10 inches) opening on one of the sides to be able to turn it inside out. Press seam. 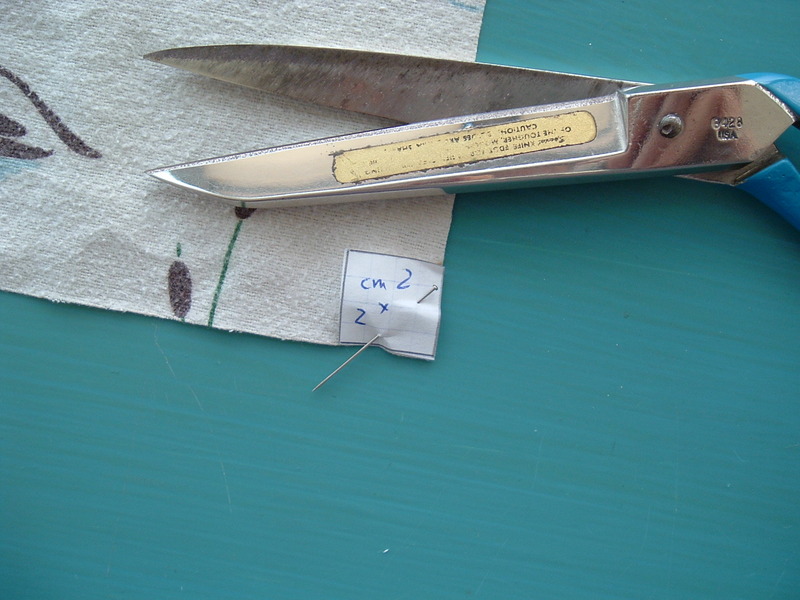 Carefully snip off outward corners, leaving a millimeter or two (1/16th inch) to the seam (see picture). Carefully snip into inward corners, leaving a millimeter or two (1/16th inch) to the seam (see picture). With the help of a pair of closed scissors at the corners turn the covers inside out. Press the now turned out cover. Press the 20cm opening together as if closed. If you're like me, you'll hem it closed it with a small seam allowance (1/2 cm 3/16 inch) from the outside. You can also hand-stitch it closed with a hidden stitch. Take the four Velcro loop (hairy side) strips (four: we cut the strip into two strips the size of the cabinet top width, and two strips the cabinet top depth) and pin them to ends of the Cover, on the side you like the least (the same one you sewed the Batting onto). Sew onto the cover. Originally I had intended to make a neat stitch all around the Velcro strip. I found out that it was a bit of a pain to sew, so I made do with one stitch down the middle of the strip. * why I chose to attach the loop and not the hook strip to the cover: the hook strip is the side everything sticks to, and I suspect would cause havoc when washing the cover. This might not be necessary, but I thought it would be easier to manage in smaller pieces, so I cut the Velcro Hook Strip into four pieces - two strips the size of the cabinet top width and two strips the size of the cabinet top depth (If like me, you have a Velcro strip for sewing, attach double sided tape to the back of the strips). Attach the strips to the top sides of the cabinet. thanks for this tutorial, I am making a sewing room and having a nice iron station like this is much better than a plain old ironing board. I'm very glad to hear that! My mother-in-law always used a folded tablecloth spread on the carpet; and sat or kneeled while ironing. we miss her. . .
Why didn't I think of that?! In my tiny house I barely have room for the sewing machine, so the ironing board stays in the laundry room outside. Of course I never iron anything and there are some things waiting to be sewn. Thanks for this wonderful idea! I read years ago to put a sheet of heavy duty aluminum foil under your ironing board cover to reflect heat back up and therefore make the ironing go a little quicker. This looks like a great idea for convenience. If i do this i have NO excuse to not get my sewing out. I am. Not a lot of people know this, but I'm actually 17 feet tall. Or I meant to write 3 feet, and then thought I should write it in metric, since the author used metric. And then I screwed it up. Stupid American Imperial system. I, for one, welcome our 0.0257575758 furlong overlord. Gee, mister, are you tall? Are you at all concerned about the content of the batting inside the mattress pad? I'd be worried that I'd be melting something I couldn't see. Good point (I should have mentioned). The batting should be made of material that can take heat. The mattress protector I used is made of cotton (doesn't melt. takes heat fairly well). I added a note to the instructable. thanx for pointing it out!